Viggo Mortensen was explaining how the story in the film Green Book still resonates today. It's about an unusual real-life friendship between his character Tony 'Lip' Vallelonga, a nightclub bouncer, and classical pianist Dr Donald Shirley, who hires him to drive to venues in the segregated Deep South in the Sixties. 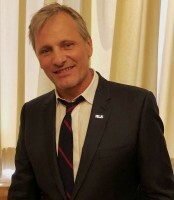 "I do think it's true that the best way to beat ignorance is through direct experience," Mortensen said of the film, which is directed by Peter Farrelly. "It's not like Tony becomes Gandhi or something. He's still himself, but he's opened his mind a little bit. So has Doc. "I think that Dr Shirley [portrayed by Mahershala Ali] comes to see, with time, that Tony has a code of ethics. He's a man of his word, and has a measure of discretion. "There's an inherent decency in him," the actor, pictured, told me over lunch, hosted by James Bond star Daniel Craig, at Patsy's Italian restaurant in New York — a fabled eaterie graced by the likes of Frank Sinatra and Barbra Streisand. I saw Green Book at the Toronto International Film Festival and enjoyed it tremendously. More than that, I was deeply touched by it. I enjoyed it even more when I caught it a second time on Wednesday — the same day it received several Bafta nominations, including best picture and recognition for Mortensen and Ali. Last Sunday it won a best picture (musical or comedy) at the Golden Globes. It's now, clearly, firmly in the Oscar race: against Roma, A Star Is Born, The Favourite and BlacKkKlansman. The real Tony Lip's two sons, Frank and Nick Vallelonga, were at the lunch and were moved by the speeches. Nick said he sheds tears every time he sees Linda Cardellini, who portrays their mother Dolores. Ms Cardellini was seated next to him, so he was in floods most of the time. It was great, too, to hear testimony about Dr Shirley — both he and Tony died in 2013, within months of each other — from the musician's friends and fellow professionals. Michiel Kappeyne, Dr Shirley's executor, said that the doctor was "a gift to the world" and described Green Book as "a gift to his legacy". I'd say that goes for both men.